Again, I’ve not yet had the dubious privilege of sitting in Court 38, a courtroom that even the Election Court judge Richard Mawrey QC himself has described as an “unofficial sauna” (there seems to be a problem with the heating system), so I can’t give a full flavour of events. But I have read some of the transcripts from the proceedings. Last week’s sittings seemed to be particularly testing. Records show Mawrey asked for Cllr Gulam Robbani to be excluded from the courtroom on Wednesday after he was accused by the petitioners’ barrister of intimidatory behaviour towards witnesses. Mawrey made no judgement on whether that was the case and stressed that the exclusion was no reflection on Lutfur Rahman. This complaint came after a long and detailed exchange between Hoar and Lutfur in which the genesis of the Tower Hamlets First party was explored. Part of the petitioners’ case is that the party was for all intents and purposes merely another embodiment of the mayor, so that acts which may have happened under its banner were linked directly to Lutfur. Mawrey took a close interest in this exchange, which I’ll paste from the transcript below. He addressed a number of detailed questions to Lutfur about how involved he was in the party’s formation and what accounts and other records they kept. In short, Lutfur’s answer was that he delegated most of that to Cllr Alibor Choudhury. Lutfur said he was the leader but left the fine details to others. Lutfur said the party was a “loose grouping” and that he hadn’t seen any party constitution, although he believed one existed. Further, Lutfur said the party didn’t have a bank account and that financing for things like election campaign materials was done through a system of donations in kind from supporters. Lutfur said the record keeping and accounts for these donations were kept properly at Alibor’s house, the party’s registered address. As a result of the questioning on this matter, Mawrey agreed an urgent request from Hoar that these records and accounts be presented to the court by 10am tomorrow morning. Hoar indicated he’d want proof they hadn’t been “forged” over the weekend. All strong stuff; Penny claimed these were “wild allegations”. The excerpt below about the history of Tower Hamlets First, and how it was formed at a meeting in an unnamed councillor’s house in late summer autumn 2013 I found particularly fascinating, not least because Lutfur’s then deputy mayor Cllr Ohid Ahmed wasn’t there. But that’s just political anorak stuff. The full transcript of Lutfur’s first day in court is here. It’s long, and he may have two or three more days of this. The excerpt about this Tower Hamlets First business is also long, but well worth a read. This is the imprint of the company making the transcript, which someone has sent me. I think residents should have access to these records. 5 registered, it is not a political party in the formal sense. 10 A. That is the date, yes. 13 Referendums Act 2000, are you not? 16 responsibilities bear down to you ultimately, do they not? 24 responsibilities, do you not? 25 A. Yes, I accept that. 7 Q. And you registered slogans; yes? 13 Q. They might be very similar? 14 A. Okay, forgive me. 18 treasurer. Who is the nominating officer? 19 A. The agent for the grouping was Councillor Choudhury. 20 Q. So, he is the treasurer and nominating officer? 21 A. The agent of the grouping, yes. 24 A. I think it is the agent who is the nominating officer. 3 A. It is Councillor Choudhury, he dealt with all the nominations. 6 nominating officer and a person as the party treasurer. 9 Q. As both nominating officer and treasurer? 11 THE COMMISSIONER: I see. 21 a specified officer of the party? 24 and the actual formalities to Councillor Choudhury. 9 formalities were complied with. 11 until just now, you did not know that was the case? 18 brought that to your attention, did you? 2 the emblem and the name going forward in the 2014 election. 3 Q. I do apologise by saying “no”, I did not mean to cut you off. 4 THE COMMISSIONER: Do you have a registered campaigners officer? 10 authorisation for candidates to stand on behalf of the party. 19 A. Yes, and he complied with those requirements. 22 things wrong, is there not? 3 its name, I believe it was properly formulated. 9 thought out and planned. Would you agree with that? 10 A. Yes, and we did form a grouping, Tower Hamlets First. 11 Q. Did you receive legal advice? 13 any problems we would have brought it to my attention. 20 necessary he attended to it. 24 going to be leader; is that your evidence? 25 A. I do not know if Councillor Choudhury obtained legal advice. 4 certainly are been brought to my attention. 5 Q. I am sorry. 12 re-admitted to the Labour Party. 14 councillors and some supporters? 17 Q. Presumably you, as mayor, chaired it? 22 idea in the first place before you can discuss it. 6 therefore, we said we would give it a name. 7 Q. Who thought up the name? 8 A. I think one of our councillors thought up the name. 10 A. No, my Lord. 12 THE WITNESS: I cannot remember. 14 pounds getting advice on branding. You know that, do you not? 24 name, they spend a lot of money on it, do they not? 3 Q. It is an important decision, it is for a political party. 7 in terms of the election, that was it. 11 what was to do and who did the paperwork. 17 Q. You must have signed at least one form as leader? 21 First because we wanted to concentrate on Tower Hamlets. 23 keen interest in politics. 24 THE WITNESS: A fair interest. 2 A. I try to keep up with current affairs. 3 Q. You have campaigned, for example, Keith Vaz? 4 A. It was not Keith Vaz, it was Mr. Ashworth. 6 degree, are you not? 11 party nor have I voted for him. 12 Q. And you go to meetings around the country, do you not? 15 is my priority, that is my passion. 17 figures on the left, were you not? Do you remember? 18 A. I do not know influential. 19 Q. In the country? 20 A. All I am interested in is Tower Hamlets. 23 A. I hardly do take an interest in what happens nationally. 3 A. I cannot remember. 6 name of the party should be changed. Do you remember that? 7 A. I cannot remember that. 10 the whole of Scotland. Do you remember? 11 A. I do not recall that. I do not remember. 14 very important, do you not? 22 Q. Where was this meeting? 24 Q. Where was the meeting? 25 A. It was one of our councillor’s houses. 2 Q. In a house? 3 A. In a councillor’s house. 8 A. I cannot give you the exact names. 10 A. Councillor Rabbani, Councillor Aminur Khan. 12 Mr. Rahman. Councillor Rabbani? 13 A. Yes. Councillor Aminur Khan, Councillor Rabina Khan. 15 A. Yes, Councillor Oliur Rahman. 16 THE COMMISSIONER: Mr. Choudhury? 17 THE WITNESS: Yes, Councillor Choudhury certainly he was there. 18 MR. HOAR: Kabir Ramis(?)? 19 THE WITNESS: No, he was there not. 21 A. No, he was not there. 22 Q. He was your deputy mayor at the time? 4 afterwards and I informed him. 5 Q. Nothing is formal, is it, Mr. Mayor? 6 A. We were not a formal grouping. 13 Rahman was my cabinet member. 16 A. He was very reluctant, all of us pushed it his way. 17 MR. HOAR: When was it, this meeting? 18 THE WITNESS: It was some time in the end of autumn of 2013. 21 Q. Towards the end of autumn? 22 A. When did we form the party, Mr. Hoar? 23 Q. Well, you tell me. I did not form the party. 25 registered in September of 2013. 2 MR. HOAR: But the witness said towards the end of autumn. 3 THE WITNESS: I did not say end of autumn. 4 MR. HOAR: Was that a slip of the tongue. 6 Q. Are you getting confused? 7 A. You said end of autumn, I said some time in autumn. 9 A. So late summer and autumn. 19 exactly. It is a pretty important meeting though, is it not? 6 Q. I understand all that? 7 A. That is all. 9 register a political party was an important decision? 10 A. In that sense, it is important, yes. 12 was and when it was? 14 Q. You can remember where it was? 20 councillors would have been invited. 21 Q. Did you think of taking a minute of the meeting? 25 Q. So, there were notes some notes of this meeting? 2 A. He took some notes on the back of a paper. 3 Q. On the back of an envelope? 4 A. I do not know what it was, paper. 5 Q. Has he still got the envelope? 6 A. I doubt he has got — the paper, I do not say envelope. 7 I doubt that he has it. 9 of matters. Can you recall who paid the fee for registration? 10 THE WITNESS: I did, my Lord. 12 accompanied by a copy of the party’s constitution? 14 Q. So, there is a constitution? 17 MR. HOAR: There is no constitution? 19 believe there is a constitution. 25 made up of conventions and other documents; is that how it is? 4 believe there is a constitution in that sense. 7 Q. Well, you are. 9 give a perfect answer as to how the party was formed. 11 you, that is what you have just said? 13 then party, if there was a written constitution. 14 A. There was not a constitution in the tradition sense, my Lord. 18 constitution, but you have never seen one? 6 scheme for regulating the financial affairs of the party? 13 MR. HOAR: Oh yes. 4 person to answer that question. 13 law, did you not? 14 A. Yes, Mr. Hoar. 17 petition, did you not? 18 A. I needed expert advice and we got expert advice. 21 registering a political party, is it not? 22 A. Mr. Choudhury may have got that advice, I do not know. 24 Mr. Choudhury got legal advice you would not know about it? 3 problems, otherwise he would have done so. 6 A. It may well be. 8 47 for submitting improper accounts, is there not? 9 A. Accounts have been submitted. 11 Act that you had absolutely no knowledge about, has he not? 16 qualified. Am I correct? 17 A. No, he is not, my Lord. 18 MR. HOAR: You are, though, are you not? 19 A. Not in election law. 20 Q. And not in contractual law either. 21 A. I am not a contractual lawyer. 24 association’s constitution, would you not? 3 properly constituted grouping of Tower Hamlets First. 4 Q. A properly constituted grouping. 14 for registering political parties. 19 the umbrella of Tower Hamlets First. 24 that from your days in the Labour Party. 4 not have a constitution? 17 was going to be a candidate? 21 is required to be a candidate. The process was this. 24 machinery as such. As I said, it was a grouping of people. 4 that was in existence. 5 Q. So in effect Councillor Choudhury chooses the candidates. 8 formalities before they could be nominated as our candidate. 12 A. We do not have a membership, a formal membership as such. 19 simply to support me” so how do you join? 25 Q. Do you want to correct that? 2 A. Let me correct that, Mr. Hoar. 3 Q. You want to correct paragraph 66, do you? 8 who did not make it through. That is all it is. 13 is nothing to it. 14 A. I would not accept that. 18 formed a party to go into the 2014 election. 22 Lordship has asked some questions. 7 Q. No, its financial arrangements. 11 affairs of the grouping, of the party. 18 Q. I follow that, but how are the financial affairs arranged? 20 about. Presumably you have a bank account. 23 money will be spent. 4 fifties. How is it physically paid? 5 MR. HOAR: Or maybe you would. 11 inappropriate in the public sphere. 12 THE COMMISSIONER: Your protest is noted. 13 A. My Lord, can I explain? 23 THE COMMISSIONER: Let Mr. Rahman finish. 3 disbursements on our behalf. 4 Q. How is that then logged? 9 declared at the appropriate stage, my Lord. 11 which the donations would be noted. 12 A. Yes, my Lord. 13 Q. And the expenditure that is made, for example, on the leaflet. 16 problem at all bringing that book on Monday morning, will you? 21 to bring it to the court on Monday morning, will you not? 22 A. You have said what you have said. I will need to speak to Mr.
24 Q. I look forward to seeing it. 2 sure he can explain. 4 A. And the process is that, my Lord. 8 MR. HOAR: That is fine. 9 MR. PENNY: I would like to make some submissions. 10 THE COMMISSIONER: In the absence of the witness or not? 12 for the witness to be removed whilst I make the submissions. 13 THE COMMISSIONER: No, if you are happy, he can stay there. 16 him to act as an advocate and an advocate who asks questions. 20 objection, if I may say so. 24 MR. HOAR: I apologise for that. 4 be put to the witness and that is entirely proper, of course. 5 Can I take you back, Mr. Rahman, to the issue of donations. 6 What you have said is that you have no bank account; yes? 9 political party will receive, is there? 10 A. There are records, Mr. Hoar, there are records. 13 account, will they not? 16 and how they have been paid. 17 Q. But that record is entirely a matter for Councillor Choudhury. 18 How he puts that together is crucial, is it not? 24 going into this bank account”, has he? 6 is keeping an accurate record, do we not? 8 in him in keeping records. 9 Q. We have to keep it entirely on his trust, do we not? 11 THE COMMISSIONER: Where are the records kept? 12 A. Councillor Choudhury keeps those. 14 A. Yes, his home is the registered address. 15 Q. His home is the registered address of the party. 16 A. Yes, my Lord. 19 else’s, would it not? 20 A. I am sure it could be cross-referenced. 22 A. Ask Councillor Choudhury when he comes in. 24 closer eye on these sorts of things, Mr. Rahman? 25 A. I do. I have full confidence in Councillor Choudhury. 3 A. He is the Council’s Cabinet member for resources and finance. 4 He has done a good job for the last five years. 6 you, he has breached the Act by not having a constitution. 14 MR. HOAR: You are much more of a Tory than a Whig, are you not? 15 You like your unwritten constitutions, do you not, Mr. Rahman? 23 changed a little since your time in the Labour Party. 24 THE COMMISSIONER: Can I just pursue something if I may. 25 Mr. Rahman, were you in court when a Mr. Dawber gave evidence? 2 A. For part of it, my Lord. 5 his company makes pretty well across the board. 12 for the party to record that donation? 17 other donations, was declared to the appropriate authorities. 24 a few pounds on a leaflet. This is many thousands of pounds. 2 received from someone who helped us. 4 would be better off asking Mr. Choudhury about all this. 5 A. Yes. That is exactly how it happened. 10 you need a brand; yes? 11 A. Yes, something to recognise it by. 12 THE COMMISSIONER: By a brand, do you mean a logo? 14 rather like THF. I am sorry about that. 18 transforming Tower Hamlets three years on”; yes? 20 used for this booklet. 2 thing that would prompt anyone to vote for you, is it not? 3 You like it. Presumably you do like it because you used it. 7 Q. Page 2 is a nice picture of you and a quote from Mayor Rahman. 9 Mayor’s foreword” with another picture of you and a quote. 11 regeneration with a quote, not from you on that occasion. 13 then a nice picture of you with a police officer at page 9. 21 Q. But it is not about you. 25 Q. By you. You paid for it? 9 Q. You cannot remember. 10 A. I can go back and find out. 11 Q. But Councillor Choudhury has got good records of this. 13 Q. And he will be able to give it to you over the weekend? 20 Q. No, he will be able to give it to you over the weekend. 21 A. He can give the information. 22 Q. To you so that you can bring it to court on Monday morning. 24 to hand, must they not, Mr. Rahman; yes? 4 find it very easy to get a copy. 6 and he has got the records. 3 Hamlets First”; “Lutfur Rahman, putting Tower Hamlets First”. 4 How many of those refer to you? 5 A. Quite a few. 6 Q. Can you count? I asked how many. 7 A. I said quite a few. 12 civil servants call you “the Mayor” all the time. 13 A. I have no comment. They also call me Lutfur. 15 we have just seen, do they not? 21 file R, with your witness statement? 3 up saying that the plaque project was opened by the Mayor. 6 in January; yes? Did you not? 8 Q. It is your witness statement. 11 for by the taxpayer, are they not? 20 — to acknowledge that. 15 entire population of Tower Hamlets. 16 MR. HOAR: Could you turn to file G, please, Mr. Rahman? 17 THE COMMISSIONER: Are we turning to another matter? 18 MR. HOAR: No, but it would be a convenient moment. 21 at twenty-minutes past three. 9 now, whether by witness summons or otherwise. 13 MR. HOAR: 31.19, I think, is disclosure, third party disclosure. 15 MR. HOAR: Alibor Choudhary is said to have this. 18 that is for sure; and certainly not me. 2 MR. HOAR: Yes, it would. I follow your Lordship’s thinking. 12 of the affairs under section 26. 20 MR. HOAR: Not the accounts. 24 this case, the political party itself. 8 at 10 o’clock on Monday morning. 12 know that anybody has in this courtroom. 14 rather than on what the Electoral Commission publish. 16 High Court judge. But there we are. 17 THE COMMISSIONER: So, my source is the Statute. 18 MR. PENNY: Yes, of course. 24 Mr. Radley for a documentary analysis? 2 produced in court by somebody at 10 o’clock on Monday morning. 5 an explanation for us. 9 at; and if none are produced, we will not. 13 THE COMMISSIONER: Mr. Hoar, Mr. Penny has an application. 19 oxygen of publicity will be feeding this on to the wires. 24 that, in my submission, is not happening at the moment. 2 my learned friend withdraw that comment. 16 is not, as it were, an emanation of the Mayor. 7 that is going on. 13 MR. HOAR: Well, Mr. Rahman cannot cope with that. 15 been made, Mr. Hoar. 18 simply does it annoy Mr. Penny, but it also does not help me. John Biggs was the star turn yesterday and he by all accounts spent five hours in the stand. The transcript of his appearance runs to 200 pages and contains 50,000 words, so that’s too long even for this blog. I’m going to make it available as a document here (Erlam & Others v Rahman & Williams – Proceedings 03.02.15 – Day 2), and I will also post his official witness statements in due course. They contain fascinating bits of evidence, much of it contested by Lutfur Rahman of course. I’ll highlight below seven pages of exchanges between John Biggs and Lutfur’s QC David Penny. They are on pp320-330 of the transcript. They give interesting insights into the way back room deals are alleged to have happened between the two politicians during the contested mayoral selection process of 2010, ie before Lutfur was expelled from Labour. Lutfur denies this meeting took place. The petitioners are being represented by Francis Hoar. The Election Court commissioner is Richard Mawrey QC. Here’s the extract from the cross-examination of John Biggs by Mr Penny. 2 the event that I became Mayor.” Is that accurate? 5 place, but there were two such meetings. 10 2013. He was the Mayor in 2013. 12 am four years out. 15 A. I am four years out. It was 2009, you are absolutely correct. 16 Q. It can make a wee bit of a difference, can it not, four years? 18 THE COMMISSIONER: So can we change that to 2009? 19 A. Yes, I apologise. 20 MR. PENNY: That is all right, do not worry. 22 got the wrong Mayoral election, you are quite right. 25 concerned, did you draft it all yourself? 2 A. Unfortunately, I did, yes. 3 Q. Each and every paragraph is yours, is it? 15 suggesting that Lutfur Rahman came to your home twice in 2009? 2 the wrong year. It was 2010. 5 get on to the shortlist first time round. 10 A. I would not agree with that, but those are your words. 12 costs; is that right? 13 A. They settled the? 14 Q. They settled the action against him and paid his costs. 16 which is my understanding of what happened. 17 Q. But one way or another, he ended up back on the shortlist. 20 that election, you were second and Mr. Abbas was third. 21 A. This selection, not the election, yes. 25 list, he challenges that, he then is on the selection list. 2 A. There is another iteration. 11 and he was placed back on it. 12 Q. Then there was the election. 13 A. No, there was then the National Executive Committee meeting. 4 but that was within the London Borough of Tower Hamlets. 6 her private address, or my ex-wife. 7 Q. Who else was there apart from Mr. Rahman? 8 A. I was thinking about this last night because I read Mr.
9 Rahman’s statement. He said the meeting did not take place. 15 guy and I accepted that. 2 shortlist. You telephoned him, did you not? 9 relays in this statement are not true. 12 may have a future in Parliament or the House of Lords? 13 A. I certainly could not have offered him such a future. 21 that and no such conversation took place. 23 down on him like a ton of bricks? 24 A. I have no recollection of saying that. 25 Q. Is it a possibility? 5 matters. I do not recall that, no. 6 Q. Are you ruling it out? 17 my interpretation of what happened. 19 desist from the legal action that he was taking? 22 would I have said in response to that? I do not know. 24 legal action that he was taking against the Labour Party? 4 which could be phrased in the fashion in paragraph 85. 7 you ruling this out? 13 desist in his legal action against the Labour Party? 15 conversation in which he said that he was minded to do that. 17 guises, but I have no recollection of such a conversation. 19 they have deselected me.” How does it go after that? 25 what I would have said. 2 Q. You were rivals, were you not? 14 quite like a war where one of you has to die at the end of it. 18 of having a political party. 22 A. Obviously we were. 24 ton of bricks” being mentioned in this conversation? 25 A. Shall I read the paragraph again? 18 that was not a reasonable request for him to make. 22 this paragraph that I am aware of. 3 discourage him from standing or making his legal challenge. 6 A. Yes, of course I did. 13 away and here we are today. 14 MR. PENNY: Indeed. Thank you very much, Mr. Biggs. Richard Mawrey QC, the Commissioner of the forthcoming Tower Hamlets election court hearing, yesterday overturned a decision to hold the trial at the Town Hall and ruled it must be heard instead at the Royal Courts of Justice in the Strand. He ruled it will start at 10am on February 2 in Court 38. It is an early victory for the four petitioners, who are led by Andy Erlam and represented by barrister Francis Hoar. Another judge at a preliminary hearing had previously rejected their request for it to be heard outside Tower Hamlets and had recommended the town hall. However, in a written ruling yesterday, Mr Mawrey said the town hall could not be considered a “neutral venue”. He said there was now “considerable hostility” in the borough to the arrival of Eric Pickles’s commissioners. And he noted that George Galloway and Ken Livingstone had made “very public calls for campaigns of harassment to be directed against what they describe as interference with the democratic process”. At a rally last month, Livingstone called for Lutfur’s supporters to protest outside the homes of the commissioners. All this has been clearly observed by Mr Mawrey. He said a “considerable” volume of evidence/allegations against Mayor Lutfur Rahman and Returning Officer John Williams had now been placed before him. He stressed he had made no judgment whatsoever on the veracity of the allegations. However, he said the allegations included suggestions there was a significant body of support for the mayor in the town hall–where an election petition would normally be heard. He also revealed in his written ruling that the Metropolitan Police had been present at the recent confidential scrutiny of the Mayor’s vote at the Royal Courts of Justice. He said the police were conducting their own investigations into electoral fraud. This time, it seems it’s all being taken much more seriously. Here is Mr Mawrey’s explanation in full. Paragraphs 7-12 are particularly interesting. NOTE: In the interests of conversational debate, I am going to allow comments on this post BUT please do not ascribe any guilt to any individual. Keep the discussion around the general issues of the election petition and the venue. I stress that allegations have been made, all of which are denied and are yet to be tried. Comments will be moderated. 1 I have confirmed with the Rota Judges that the powers conferred on an Election Commissioner under the Representation of the People Act 1983 (‘the 1983 Act’) s130(5) entitle a Commissioner to order that the trial should take place outside the electoral area under s 130(6). Such an order may be made if the court is ‘satisfied that special circumstances exist rendering it desirable that the petition should be tried elsewhere’. 2 I appreciate that an application was made to Mr Justice Supperstone for an order under s 130(6) and that on 31 July 2014, he dismissed that application. I have read his judgment on that occasion which sets out the grounds on which the Petitioners were then contending that the trial should take place outside the Borough and the reasons why the Judge rejected those grounds and refused the order. Having considered that judgment I would say, respectfully, that I entirely agree with it and that it was the correct decision to be made on the limited grounds and the equally limited evidential material before the court on that occasion. 3 The position today is entirely different from that which was before Supperstone J in July. The parties’ cases have been fully pleaded and a very considerable volume of evidence has been served. 4 May I emphasize at this point that I have, as yet, seen and heard none of the witnesses and I have formed no conclusions on the evidence whatsoever. At this stage of the proceedings the allegations made by all parties in their witness statements remain allegations, to be proved or disproved at trial. Insofar as I have taken those witness statements into account when making this decision, I have in no way prejudged their reliability or veracity. My approach is to treat the allegations on the basis that they might be true or they might not. 5 In general the most likely venue for the trial of a petition challenging a local authority election is the authority’s Town Hall. It is not the inevitable venue and I have tried other petitions (notably Birmingham) in some other building within the electoral area. In this petition, however, the Town Hall was put forward as the most suitable venue and I shall approach the question by considering that venue first. 6 As the parties are aware, I have been uneasy about the Town Hall as a venue from an early stage. This case differs from the norm of local authority petitions. Historically, local election petitions have concerned events in a single ward (occasionally two wards as in Birmingham in 2005). In those circumstances, the Town Hall of the Borough represents both a convenient and a relatively neutral venue. Here the challenge is to the election of an executive mayor whose headquarters is inevitably the Town Hall itself. Even were feelings not running as high as they are here, there must be grave doubts as to propriety of a petition to unseat an executive mayor being tried in his own Town Hall. 7 This case is unusual in that there are persistent and highly publicised allegations that witnesses, in particular witnesses for the Petitioners, have been subject to intimidation of themselves or their families both within the Borough and, indeed, in Bangladesh. Certain of the witness statements have been served with the names and addresses of the witness redacted and there is a possibility that I shall be asked to make witness anonymity orders. As said above, I cannot and do not at this stage decide whether these allegations are well-founded but it would be irresponsible to discount them and to decide the venue in a vacuum. 8 I have also to look at the question of intimidation in the context of the allegations, supported by witness statements, of widespread voter intimidation at the polls. These allegations also cannot be ignored. I fully appreciate that the first Respondent denies the allegations of intimidation and denies that, if it did occur, it can be laid at his door. None the less the evidence submitted does raise at least a triable issue as to intimidation. 9 Furthermore the Town Hall cannot realistically be regarded as a neutral venue. The witness statements include a body of evidence to the effect that the Town Hall staff contains a significant body of political supporters of Mr Rahman whose conduct in the past is said to have gone well beyond what is permissible in the case of local civil servants. There are also allegations (which may or may not be well founded) of Town Hall staff having been involved in (or at least complicit in) active electoral fraud. 10 In this context, though I accept that it is not yet evidence in the case and may never become so, these allegations find considerable support in the PwC report commissioned by the Secretary of State for Communities and Local Government. It would do little to enhance the view of the court as a neutral and impartial venue if it were held in a venue which is perceived (rightly or wrongly) to be staffed by people who are, to put it neutrally, partisan. There would be legitimate fears that the staff might obstruct or identify vulnerable witnesses and, whatever precautions are taken, the security of documents would always have a question mark over it (however unjustified that might turn out to be). 11 When the matter was before Supperstone J the concern raised was of disorder at the trial and the Judge pointed, quite rightly, to the powers of a Commissioner to enlist the assistance of the Police. Events have, as said above, moved on somewhat. It is no longer primarily a question of maintaining an orderly trial. If that were the only concern, I would not be revisiting the earlier decision. The fact is that the position of the Metropolitan Police has become more complex, as it is no secret that the Met is conducting its own enquiries as to potential criminal offences committed in the course of the May election (hence the involvement of officers at the Scrutiny) and has been further dragged into this case by the allegations made on both sides of witness intimidation. Nor can I overlook that the case itself does involve criticism (which, as I say, may be entirely unfounded) of the involvement of the Met in policing the election itself. Thus the issues raised before Supperstone J have been overtaken by the subsequent history of this petition. 12 An additional change of circumstances arises from the Secretary of State’s publication of the PwC report and his appointment of commissioners to take over certain of the functions of the Council. Those commissioners have already started work at the Town Hall. The appointment of the commissioners has been met with considerable hostility in certain areas and I cannot overlook the fact that, at a rally attended by the first Respondent, certain of his high-profile political supporters such as Mr Ken Livingstone and Mr George Galloway MP made very public (and much broadcast) calls for campaigns of harassment to be directed against what they describe as interference with the democratic process. 13 This might be mitigated if the Town Hall were otherwise a suitable venue for a trial but it is not. I carried out an inspection last week and the facilities are simply not appropriate for a lengthy trial. The only available courtroom is the Council Chamber. This cannot really be converted into an acceptable courtroom. It has fixed desks which are not convenient for a three-party case, especially one with copious documents. There is no real space for a ‘witness box’. Everything would have to be cleared out for Council meetings. There are no practicable rooms for the judge’s retiring or for the parties’ legal teams. More to the point, the Council Chamber is in the heart of the office area with the staff problems already referred to. 14 For all these reasons I have ruled out the Town Hall as a venue. 15 I indicated at an early stage, when the Petitioners raised their objections, that the parties should attempt to find possible alternative venues within the Borough. The Returning Officer and his solicitors have made considerable efforts to find an alternative venue and I made a tour of the four venues they had located. None of them was remotely suitable and some of the problems involved in the Town Hall as a venue would have applied to those venues even if they had been suitable. 16 I have thus, with great reluctance, come to the conclusion that there are here the kind of special circumstances envisaged by the 1983 Act and that the proper course is to order the trial to be held in the Royal Courts of Justice. 17 Supperstone J remarked, quite correctly if I may say so, one of the reasons for holding election courts in the electoral area concerned is to allow local public access to the court. This is fair as far as it goes but it must be seen in context. When the rule developed in the nineteenth century public transport was much less available and much less affordable than today. In any event, the rule itself does carry its own limitations. In my experience, petitions challenging the election in a ward of the council are heard centrally (often in the Town Hall) which in a large electoral area (Birmingham is a good example) may be several miles away from the ward concerned. 18 The RCJ are, of course, situated in the City of London which is the borough immediately adjacent to Tower Hamlets. If the contested election had been in, say, Merton or Enfield, then the difficulty of the citizens of the borough attending court would be a significant factor. The RCJ may be considered one of the easiest places to get to by public transport in central London and I cannot see any appreciable hardship involved in the citizens of Tower Hamlets attending a trial there. 19 I have therefore liaised with Mr Evans of the Elections Office and he has secured the use of Court 38. It is a large court and its position in the West Green Building will obviate many of the problems attendant on use of a court in the main building. 20 I realise that this may cause some inconvenience to the Respondents but I am satisfied that the interests of a fair and publically transparent trial require the move to be made. 21 Finally I should wish to record in these reasons my thanks to Mr Emyr Thomas of the second Respondent’s solicitors for his part in locating and inspecting the alternative venues. John Biggs tells Ken Livingstone: ‘You’re plain wrong on Lutfur Rahman’. But could Lutfur be eyeing Westminster? Below is a letter that Labour’s John Biggs has sent to a few local papers in which he criticises Ken Livingstone’s support for Lutfur Rahman. John lost of course by some 3,000 second round votes in May to Lutfur. He remains a London Assembly member for the City & East constituency. He is also likely to be called and cross-examined as a witness for the Tower Hamlets election petitioners in the forthcoming court hearing. That hearing, by the way, is likely to start at the end of January. It could well last between two and three months, which would mean any mayoral election re-run taking place after May’s general election. It’s not at all certain, of course, who would contest such a re-run. Were Lutfur to lose the hearing he might be barred from office. 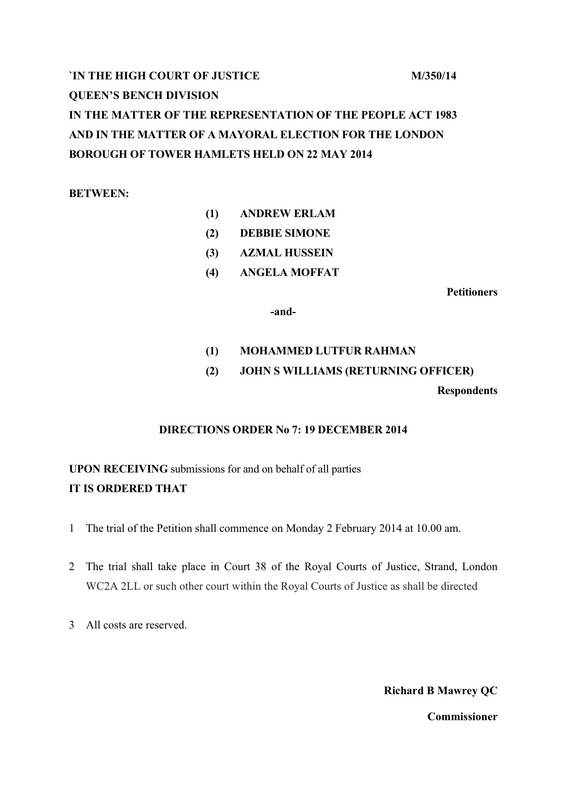 It could be, however, that the judge rules the actual count unlawful, but that it was not Lutfur’s fault. In that case, Lutfur might be free to stand again. 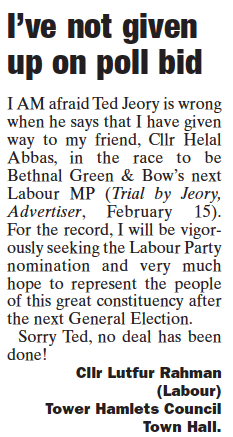 Would John Biggs want to contest a re-run anyway? Would the party locally or regionally want him to? Would Lutfur want to stand again? He seems to be trying to raise/improve his national profile at the moment as a darling of the Left. He’s changed his Twitter photograph to show a more workmanlike down-to-earth image: tie loosened, shirt sleeves rolled up. And the people who write his Tweets for him are concentrating far more on national, as opposed to local, political and social issues. I’ve written on here a few times about the internal battle within his Tower Hamlets First party over who might stand against Rushanara Ali in Bethnal Green and Bow next May. Speculation has previously centred on Abjol Miah (who still encourages people to “vote Respect” on Twitter), Rabina Khan and possibly Ohid Ahmed. But I wonder whether Lutfur himself might be interested? Were Lutfur to stand next May, it would mean campaigning during the period of the Election Court…when his expensively assembled legal team could be making headlines for him. I have great respect for the achievements of Ken Livingstone, and was proud to have worked alongside him for eight years at City Hall. His vision for London is, in my view, unmatched. The Olympics, massive transport investment, and a focus on policing which helped to restore public confidence, would not have happened without him. His focus on the plight of those on low incomes, and on helping people to get the skills they need for employment and to help themselves, was a vital part of his work too. While not everything he did was right, a lot was and his successor, Boris Johnson, has coasted on his achievements, unwisely reversing some while, as with the Olympics, Crossrail and police numbers, brazenly trying to claim credit for others (even while, in some cases, undermining them). Ken’s genuine passion for our City made him, in my view, a great and visionary London Mayor. And I pay great respect also to his work while at the GLC. In particular he will be remembered for his work on equalities, challenging discrimination and disadvantage faced by many simply because of their race, gender, sexuality, physical ability or the disadvantage or poverty of their background. At the time he was attacked as dangerously left wing and ‘politically correct’. Nowadays those views are generally seen as part of proper mainstream thinking – not about a free lunch, but about a greater fairness. Again, not everything he did was right but his legacy is solid. However, he is absolutely wrong in his recent comments about Tower Hamlets politics. Politics is about passions, strong opinions and different priorities. However, his representation of Tower Hamlets Mayor Lutfur Rahman as a victim of a stitch up is just plain wrong. I and others am proud to have played a part in helping East Enders from different backgrounds and cultures to have access to power. But we are in a different age now – people who are in power have a duty to act properly, and high standards apply to everyone. The local Mayor, who has, I am sure, many positive qualities, has seriously failed the East End and Ken does nobody a service, in any community, by pretending it is someone else’s fault. While Ken Livingstone and a small minority of those who claim to be on the Left, believe Lutfur Rahman is a victim, in my view, and that of many, many others, it is the people of Tower Hamlets, including in the Bengali community, who are the victims of his misuse of power in the Town Hall. I am proud to have worked with Ken but disappointed that he is unwilling to see this. He is at risk of the classic error of the Left, of fighting internal battles and living in the past. We need to move on from this. This is a guest post by Andy Erlam, one of the four Tower Hamlets election petitioners (along with Debbie Simone, Azmal Hussain and Angela Moffat). It’s a response to my blog post yesterday, here. It is kind of Ted Jeory to give some more uninvited advice about how we best manage the Election Petition case. However, we are sure Commissioner Mawrey QC does not need his instructions interpreted by Ted. The Commissioner has announced that he may allow statements to be included in the case without the names and addresses being revealed to Lutfur Rahman or John Williams or their legal teams. This is a significant development which we had a duty to inform the press and the public of. There are some other inaccuracies in Ted’s account, which is not surprising as he did not attend the Press Conference. Who did attend, we are told, was a spy for Lutfur Rahman, an uninvited solicitor, a trespasser in fact, so Ted may wish to check with him/her. The comment made by Janet Digby-Baker OBE was slightly misquoted. The case she was referring to was another case and she made it to illustrate how nasty intimidation can become. Of course, the intimidation and the threatening of witnesses is itself an extremely serious criminal offence, punishable by imprisonment on conviction. This is the worst way to show contempt for the court and we will not shy away from reporting each and every reported incident to both the court and to the police and carefully monitor progress of any investigation. The police have not yet covered themselves in glory in this case, but we live in hope. We will respect the court but we expect our opponents to respect the people. The Scrutiny of the entire mayor election vote starts in the High Court on Monday morning November 3 and as it takes place in the Royal Court of Justice, we can expect that it will be a sedate affair with special care taken towards transparency and due process. We leave it to your readers to decide whether this will be better than the Tower Hamlets election count of May 23-27.
Who is financing Lutfur’s hugely expensive legal team? Are we certain the Tower Hamlets ratepayer isn’t somehow financing Lutfur’s legal team? What does the PwC report show and recommend? Surely a leak from PwC can be organised? I am reliably informed that LBTH has tried to “lean” on PwC which if true is surely another gross miscalculation. ‎Ted predicted wrongly that we would be laughed out of court at the initial High Court hearing in July. In fact, the unwise attempt to have the case struck-out supported by 10 QCs and solicitors ‎(yes 10 and some paid for by the tax payer) against our brilliant barrister, Francis Hoar, was thrown out of court. 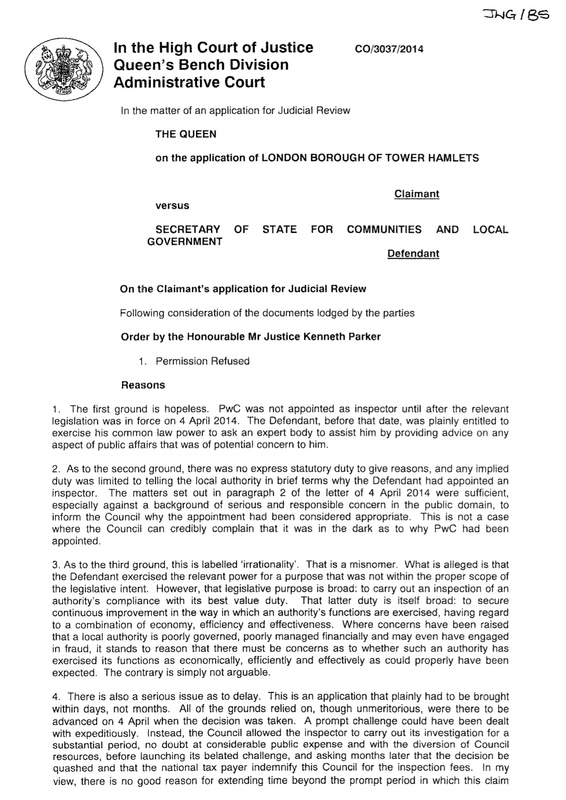 A further High Court Challenge over the PwC report, also paid for by the Tower Hamlets taxpayer, was later rejected by another judge as “hopeless”. That has not deterred the mayor from seeking another expensive oral hearing which will take place on November 14. Ted may be impressed by famous QCs but we will not be intimidated. Taking on hugely expensive lawyers is not a sign of strength, but of weakness. We are not frightened of anyone. Comment by Ted Jeory: I’m a bit puzzled that a petitioner who is going to court over allegations of impropriety is urging someone in PwC to leak an official report. I think Andy is right to ask who is funding Lutfur’s legal team; maybe he should set down a marker and fully disclose who is funding his own team. I maintain that the petitioners are brave…but they’d perhaps be wiser to do their talking in the courtroom (as I think Richard Mawrey QC would prefer). You may well have read yesterday that Richard Mawrey QC, the judge in the forthcoming Election Court petition for Tower Hamlets, had apparently intervened following allegations of witness intimidation. The petitioners had hosted a press conference in Brick Lane on Monday evening to outline their concerns. The petitioner’s chair, Dame Janet Digby-Baker, who runs a fostering agency in Mile End, said they had been told by at least one witness that their families in Bangladesh would “would be hurt” or even “killed” if they did not withdraw their statements. According to a thoroughly confused report of the press conference by Breitbart London, here, these allegations had caused Mr Mawrey to make a ruling that “witnesses’ names and addresses will no longer be made public”. Petitioner Andy Erlam said another man who had complained to the petition that his postal ballot paper had been stolen had been “approached by strangers six or seven times on the street and aggressively confronted about ‘why he was attacking the mayor'”. Mr Erlam said Richard Mawrey QC, the Commissioner in the trial, had this week made the decision to allow anonymous witness statements in light of the accusations The group also appealed for victims of intimidation to contact the police. 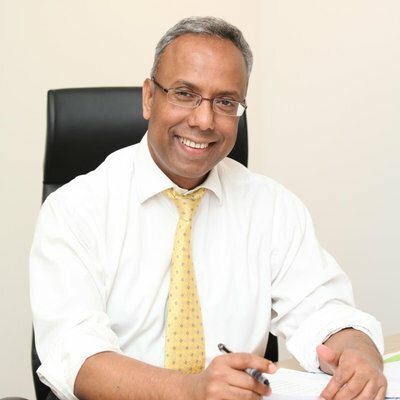 The petitioners made clear that they were not in any way connecting Mayor Lutfur Rahman to the allegations. …I have the power in circumstances where I feel that a witness may be subject to intimidation or reprisal if he gives evidence to allow that witness to give evidence with his identity disclosed only to to the court and not to the other parties (or to the other parties’ lawyers only). I have exercised that power in the past and would do so again. As a result of the news reports, Mr Mawrey, who is surely now beginning to realise what it’s like operating in Tower Hamlets, today sent a further email to the parties to the record straight. If, at he hearing, I am satisfied that there has been or may be a risk of intimidation, I have the power to hear evidence in camera or to permit identities of witnesses to be withheld from the parties and the public. I have not, of course, said that I am currently satisfied that there is such a risk or that I shall make any such order and I hope this is clear to all parties. This appears to be a judicial expression of judicial irritation. I appreciate that this petition is hotly contested and all parties feel strongly about the issues raised in it. The issues are now sub judice and I consider that they should be treated as such even though petitions do not involve juries. The petitioners may have “missed the memo”, so to speak. As it happens, they may well have to up their game because Lutfur has just appointed a new barrister. Jonathan Laidlaw QC, described (on his chambers’ website) as “one of the country’s leading silks”, is now acting alongside his more longstanding counsel, Helen Mountfield QC. Laidlaw, who successfully defended former News International boss Rebekah Brooks in the phone hacking trial, has been hired to provide clout on some of the allegations of criminality in the petition. Mountfield, who acted successfully for Lib Dem Elwyn Watkins against Labour’s Phil Woolas in the 2010 Oldham East Election Court petition, is considered more of a public law specialist. It’s not yet clear whether both will act during the court hearing itself, which is expected in the New Year. It depends on which parts of the petition Mr Mawrey allows through to the courtroom. It’s also worth noting that both silks are extremely expensive, Laidlaw particularly so. And it’s also worth re-emphasising their fees will not be paid from public funds. This is entirely a private risk for Lutfur, who faces possible bankruptcy if he loses. However, he has set up a fighting fund to help cover his legal fees. I don’t know how much he’s raised or who the donors are. Neither am I clear whether the fund or its backers must be declared publicly, eg on Lutfur’s register of interests. Can anyone help with this? I keep being asked what’s the latest with the PwC report that Eric Pickles was due to announce in the Commons last week. The answer is that it’s all a bit unclear. I’m told Tower Hamlets council, with a certain “coup de theatre“, dumped a whole load of new documents on the PwC auditors at the very last minute of the report’s preparation (and five months after the investigation started). This has caused something of a delay. Parallel to this is another potentially interesting little conundrum. 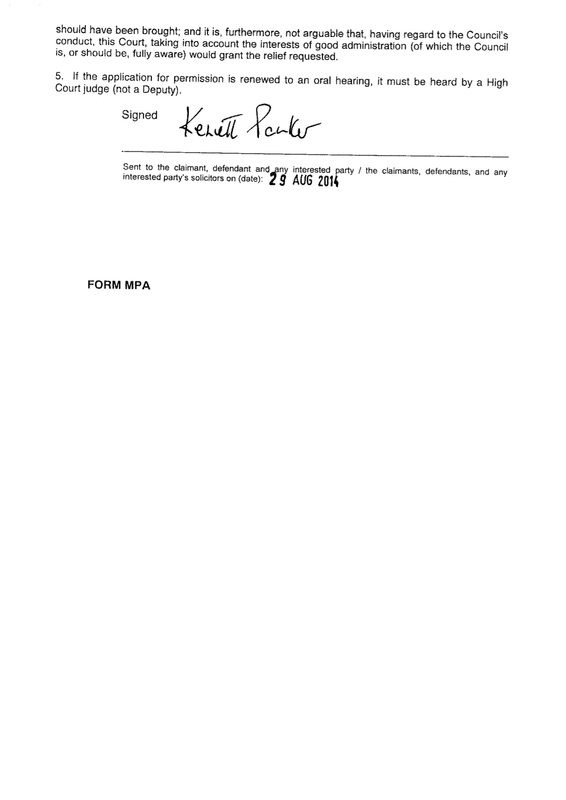 At the end of August, High Court Judge Sir Kenneth Parker declined an application from the council for a judicial review of the decision to send in the auditors in the first place. However, as The Wharf reported in September, the council was undeterred and applied for an oral hearing before another judge. This has been granted and a date has been fixed for next month. Here’s the question I’ve asked…Surely it would be illogical to publish the report ahead of that judicial review? If the court rules in favour of the council, ie it rules it was unlawful to send in PwC, then surely that would mean the report itself was unlawful in some way? Put it another way: what would be the point of the JR hearing if by that time Eric Pickles had already published the report? Would that hearing then be obsolete in practical terms? If the report was so damning that Eric determined intervention was necessary, could that intervention then take place if the JR rules his original decision was unlawful. He’d be in a bit of a pickle, and embarrassed politically. Wouldn’t the council’s lawyers want to apply for an injunction on publication of the report prior to the JR hearing? Camp Lutfur Rahman is keeping quiet on the matter. Sources in Eric’s Department for Communities and Local Government, meanwhile, say the two issues are separate. But I do wonder whether they might wait until after the JR.
Maybe one of the learned readers out there can help? As for the Election Court petition, that is still going ahead. I’m being told by town hall sources it’s likely to happen in January, although the venue is still unconfirmed. It’s quite possible it won’t take place at the town hall in Mulberry Place after all, but at another building that can accommodate an accompanying media and public circus. York Hall, the famous boxing venue in Bethnal Green, might be one (very appropriate) option.